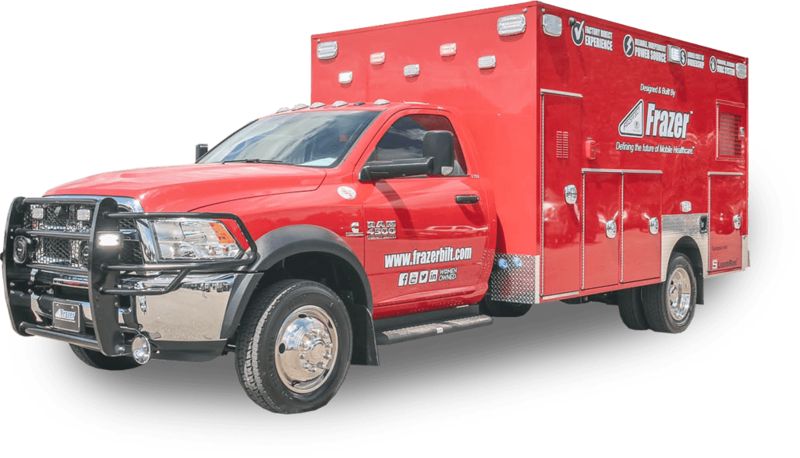 Modular body styles mounted to a variety of truck chassis primarily used for Advanced Life Support and rescue work. The Type I is the most popular product in our line of Generator-Powered EMS Vehicles. Frazer vehicles are designed from the ground up to maximize available space, providing an environment that is not only efficient, but is also comfortable and a pleasure to work in. 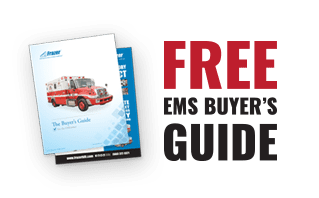 Learn more about our custom Type I EMS vehicle options and visit our Videos page to see customer deliveries and features! The Type I 14 ft module is the perfect solution for services that need extra space. The larger module interior accommodates more equipment and allows for larger paramedic crews to easily move around without limiting their interaction with patients. Extra exterior storage capacity allows for items like rescue gear, turnout-gear, extra backboards and any additional equipment your service requires. The Type I 12 ft module is perfect for most EMS services. A thoughtfully designed interior allows six medics to comfortably care for a patient at one time. Ultra-durable, all-aluminum cabinets are strategically positioned within the module to allow for easy access while seated and safe. Every Frazer comes loaded with abundant storage options that are designed to handle all of your life saving equipment. Cabinets All-aluminum, powder coated, 12” deep cabinets with scratch-resistant/shatter-proof polycarbonate cabinet doors with restocking feature. Cushions Seamless, vacuum formed cushions attached with heavy duty magnets. Flooring Vinyl flooring with laminate subfloor composed of aluminum & polycarbonate sheeting. Air Conditioner Self-contained 120VAC air conditioner/heater with UV light – proven 35 degree temperature differential, runs independent of chassis. Wall Surfaces Bright, white interior wall surfaces for clean clinical appearance. Cot Mounting Center mounted cot. Insulation 3 part insulation – radiant barrier, sound dampener, thermal layer. Construction Completely wood free module with fully welded structural grade aluminum tubing on entire unit frame. Chassis Mounting Steel shear plate mounting per chassis manufacturer’s instructions. Compartment Latches Chrome automotive-style rotary latches at all entry and compartment doors. Oxygen Storage Horizontal storage for “H” or “M” oxygen cylinder at the front wall. Rear Bumper Rear bumper in three sections including folding center section. Removable Panels Removable panels and latches on all exterior doors. On-board Generator 120 VAC generator for full, independent power to the patient module. Power Supply 125 amp with life-time warranty, 120VAC to 12VDC provides module 12VDC power without drawing from the chassis alternator/battery system. Fail-Safe Automatic fail-safe system provides 12VDC power to the patient module in case of generator interruption without medic involvement. Shore Power 30 amp shore power receptacle allows running air conditioner/heater in the station. Power Studs Battery, ignition, ground and fail-safe studs in electrical compartment & console. Serviceability External compartments for electrical, air conditioner, and generator & Center, transverse and perimeter electrical raceways for total access. Lighting All LED interior, compartment, emergency & scene lighting.